I was talking to a friend recently about cooking and he asked if I had a side dish recipe for broccoli. 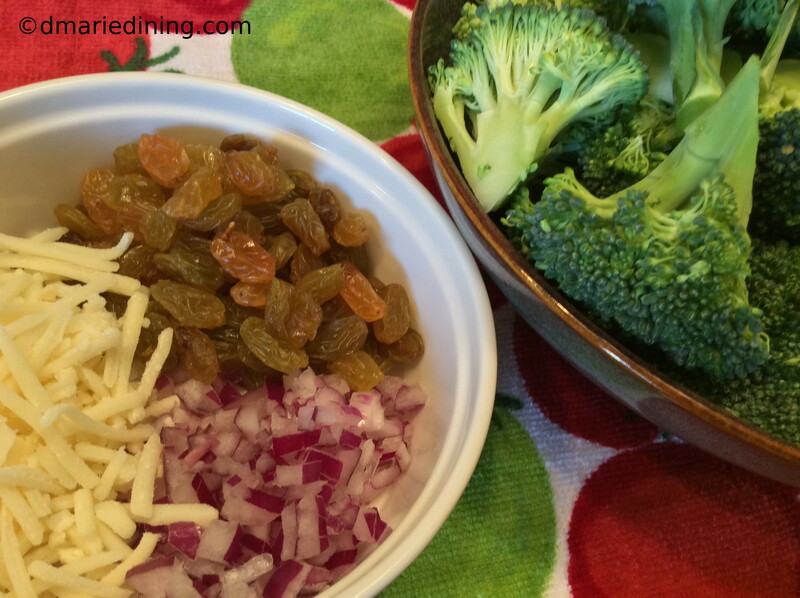 I just happen to have a broccoli side dish but it was still in my head and not on paper. I figured now was a good time to try it out on my taste testers then share it with my friend and others on dmariedining.com. 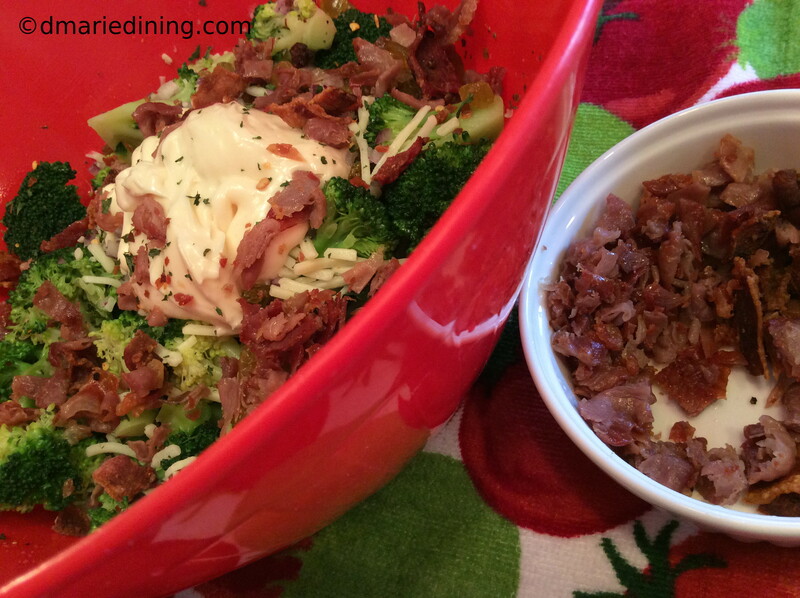 Broccoli salad is one of my personal favorites and I always looked forward to eating it when a close friend would make it for parties. However, I never took the time to make this wonderful dish because I did not think my family would eat it. I didn’t want to have a boat load of broccoli salad left over for days if I made it and no one else would try it. Imagine my surprise when my hubby said he would be willing to taste the salad when he saw me preparing the recipe. 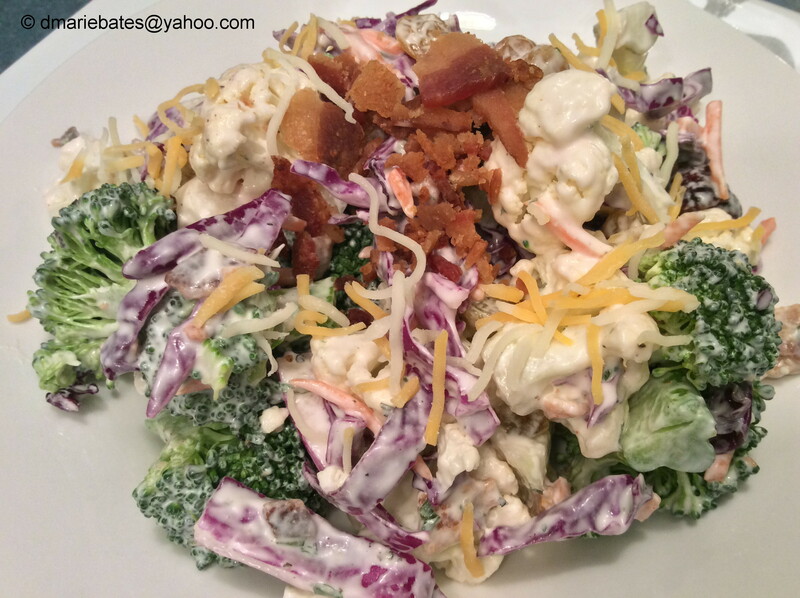 My hubby is not a big fan of mayonnaise which is another reason I thought he might not like broccoli salad. 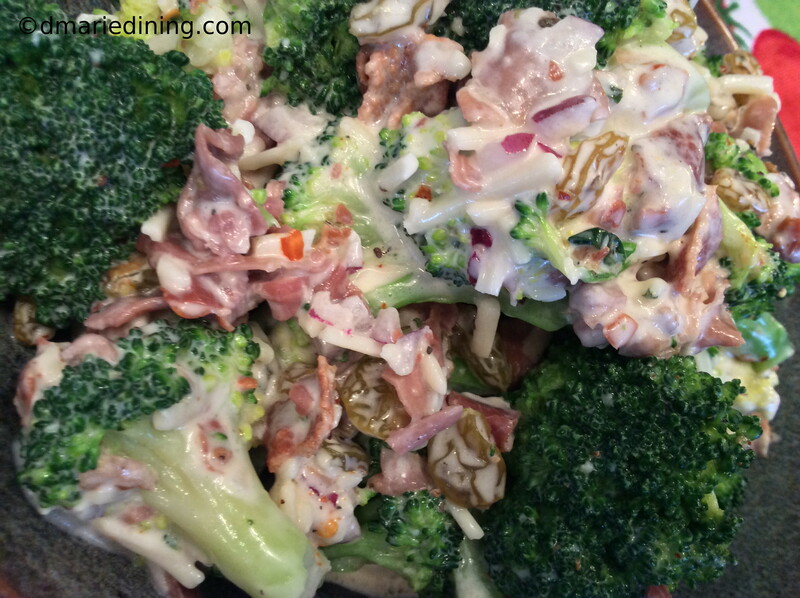 Although broccoli is the star of the dish it all comes together with the mayo. 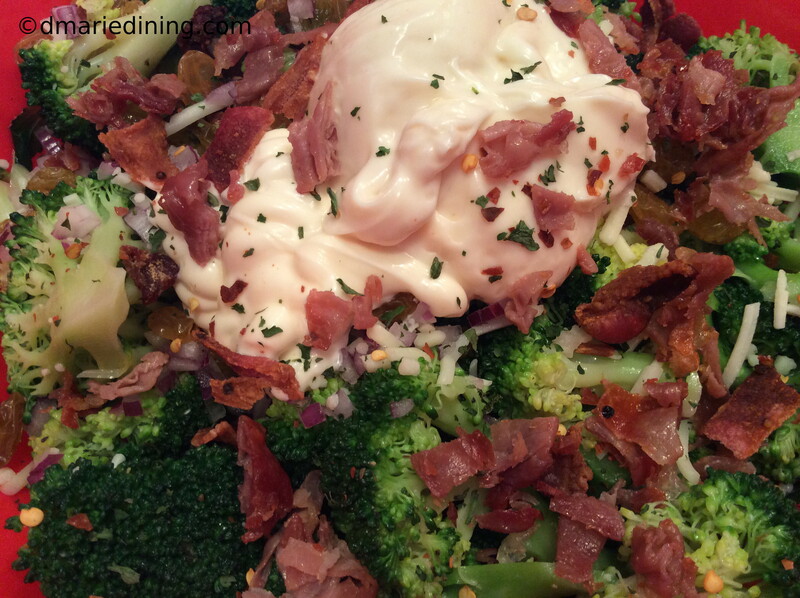 Fortunately, the broccoli salad recipe I came up with is not too creamy and is complimented by the mayonnaise. 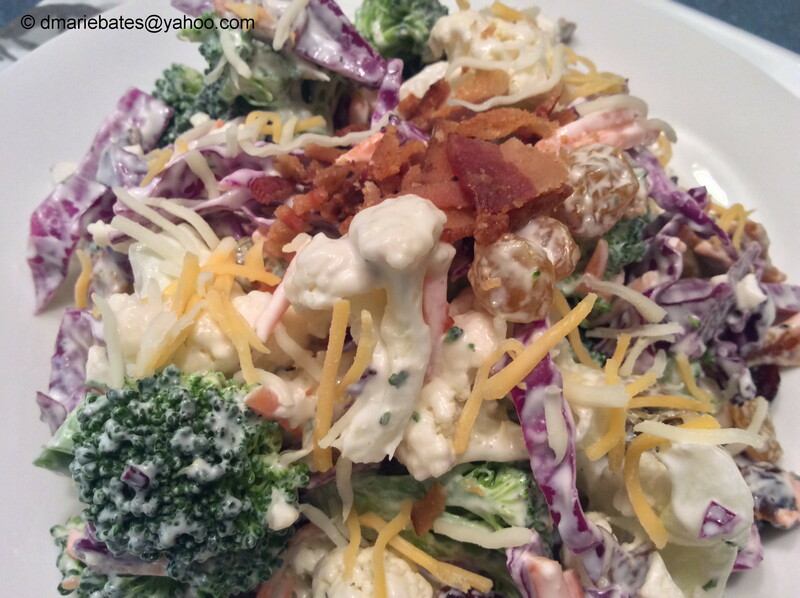 I must say I held my breath while my hubby tasted the broccoli salad. Again, I was pleasantly surprised when he said he really liked it. He especially liked the taste of the prosciutto with the broccoli and the slight sweetness of the golden raisins. 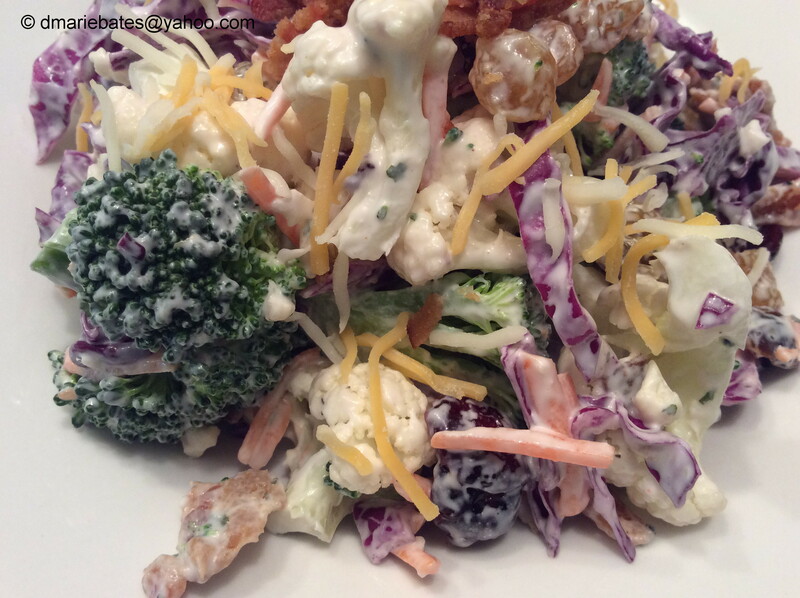 For me, the best thing about broccoli salad is that it is good no matter the season. Winter, spring, summer or fall this is a recipe that works all the time. Prepare 4 cups of cold water with ice cubes in a large bowl and set aside. Heat olive oil in a small frying pan. Add prosciutto and lightly fry until crisp. Drain, chop and set aside. 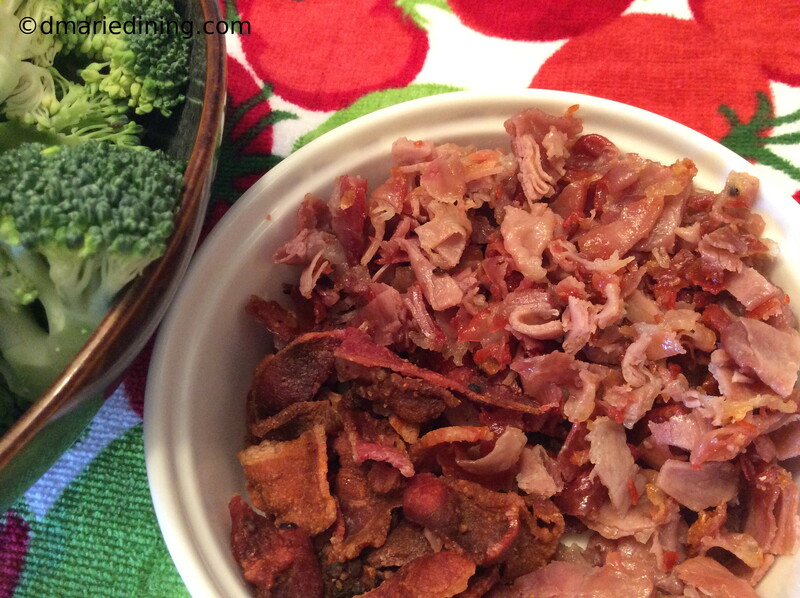 Bacon can be oven fried, crisped in the microwave or fried on the stove. Drain, chop and set aside. Bring 4 cups of salted water to a boil. 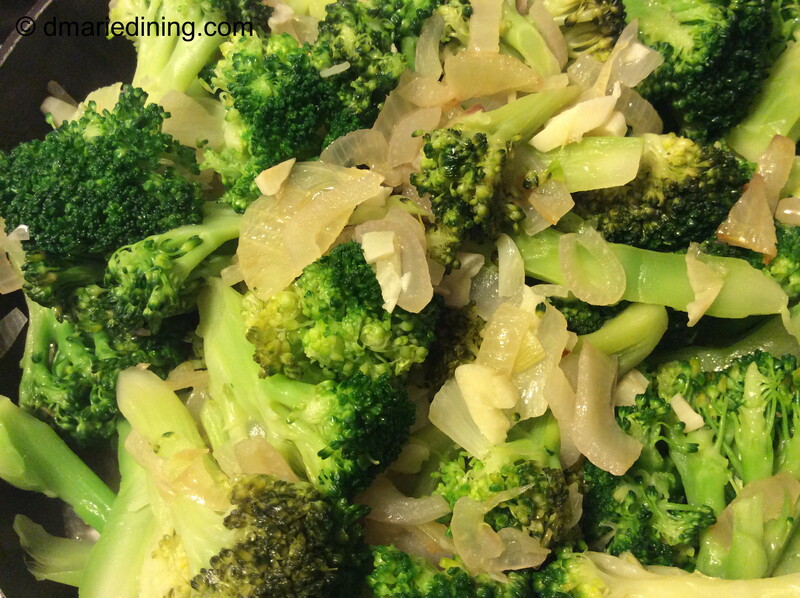 Add broccoli florets and cook for 3 minutes. Remove broccoli and immediately place in the ice bath to stop the cooking process. Let sit for a couple of minutes then drain. Remove any stray pieces of ice. 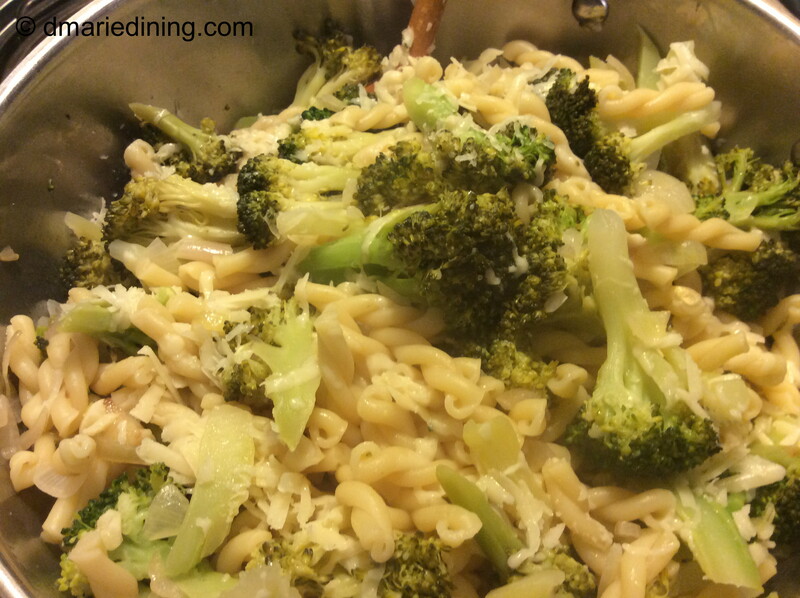 In a large bowl add broccoli and pour salad dressing over the broccoli. Add remaining ingredients and mix gently until well blended. Chill for 30 minutes or overnight. 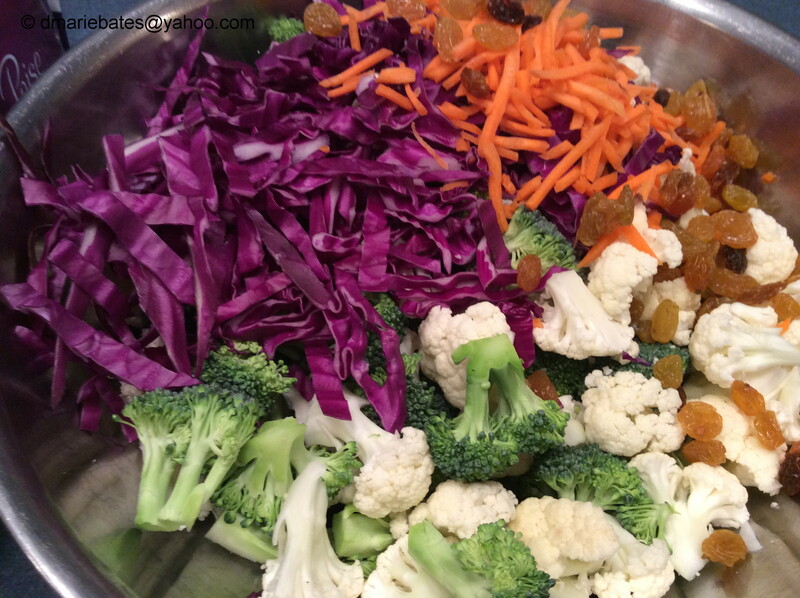 Stir salad before serving. Who said creamy was the best way to make potato salad? 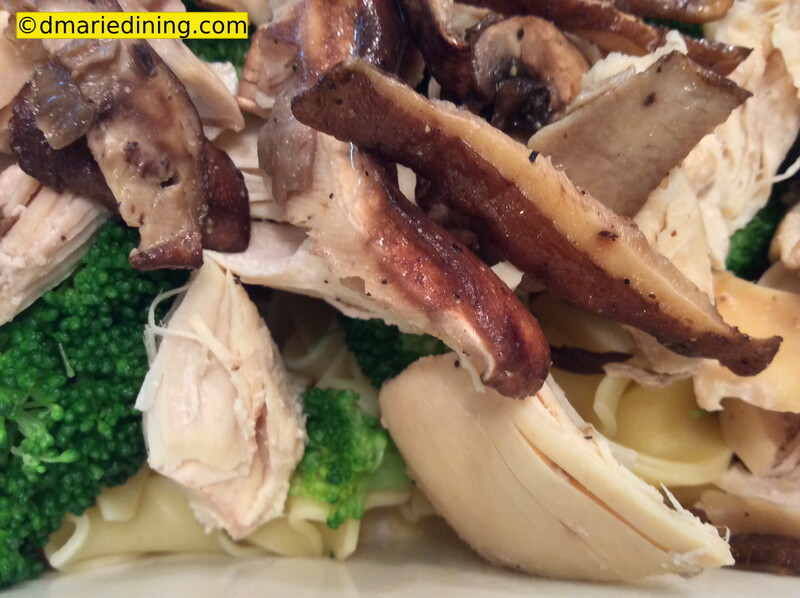 I did until I started focusing on new ways to prepare some of my old recipes. 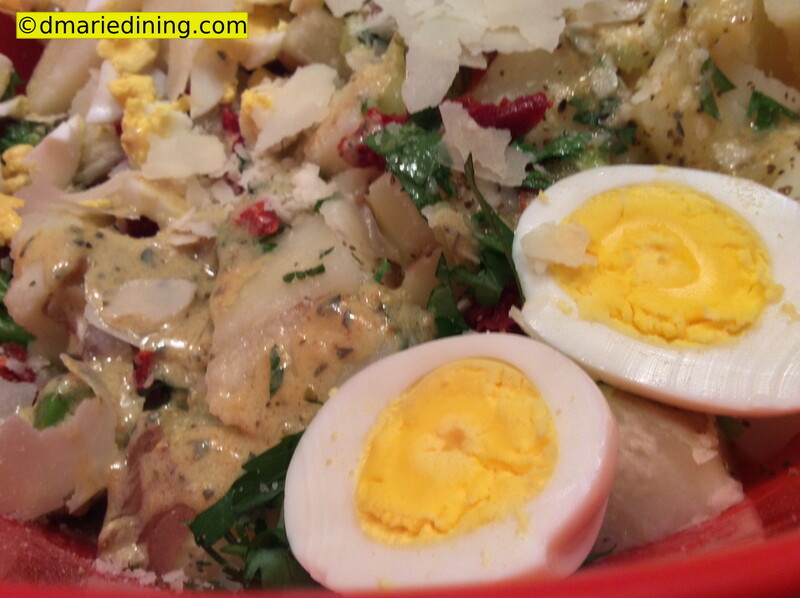 I love potatoes in general so potato salad is also a favorite. However, I had to find a simple way to cut down on calories but still have a great tasting dish when all was said and done. I think (and so does my family) that I hit the mark with my “New Kind of Potato Salad”. 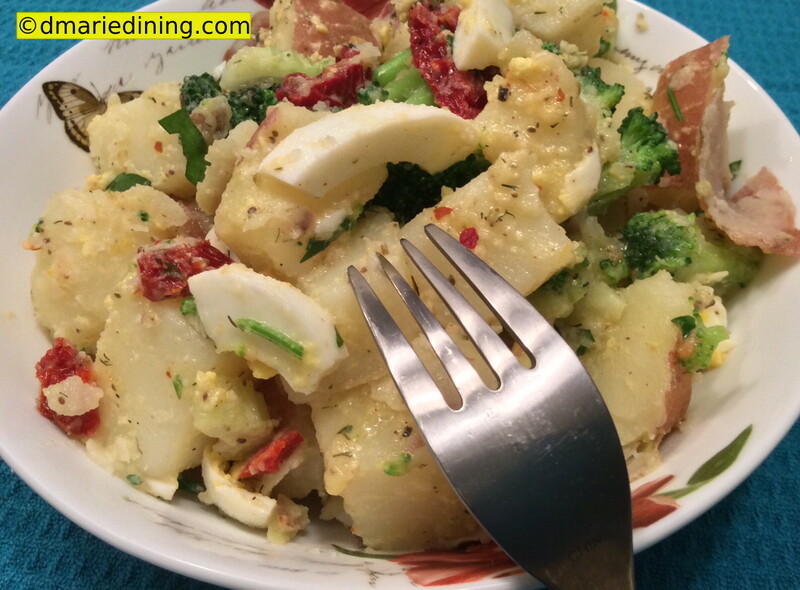 It still has layers of flavor and has many of the ingredients you would put into a creamy potato salad. Believe it or not, if it were not for the mayonnaise in potato salad it would be considered quite healthy. Eggs provide protein and essential amino acids. One stalk of celery has about 10 calories so eat up. Potatoes? Well, potatoes are not the villain most folks think they are regarding maintaining good health. Actually, certain potatoes have only 26 calories and are considered a complex carbohydrate which is better than simple carbohydrates like sugar or bread. Eating potatoes the right way will help make you feel full quicker and will satisfy your taste buds. So, put away the mayonnaise and pick up Gazebo Room Greek Salad Dressing and Marinade. 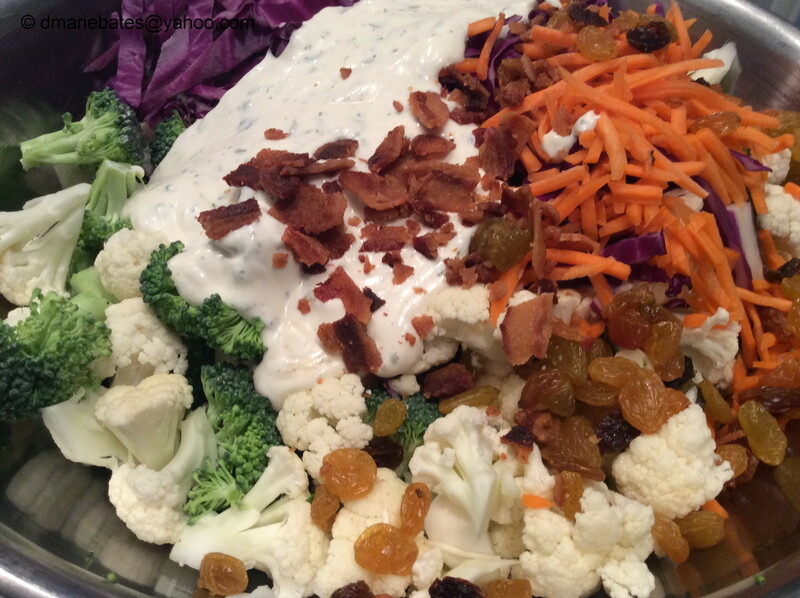 This is a light delicious dressing that adds tons of flavor to every dish I include it in. 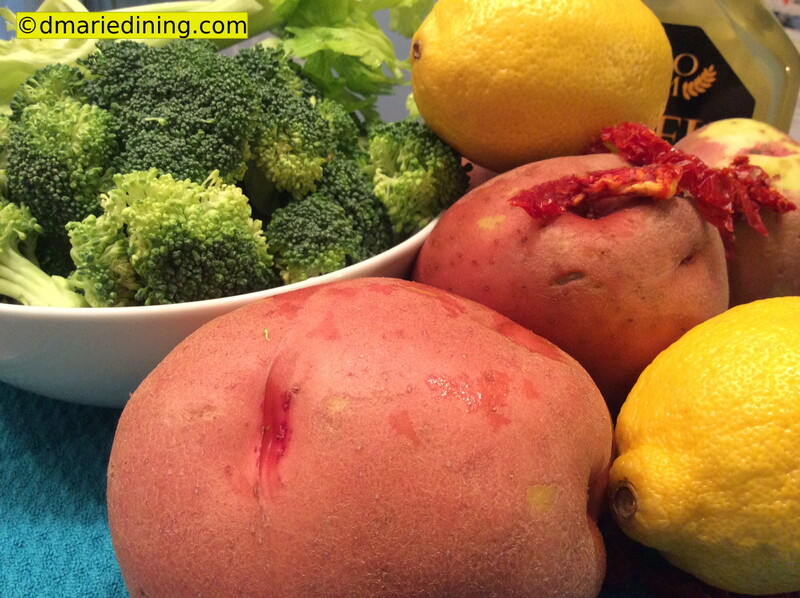 Potatoes can act like a sponge and will soak up the dressing so you can limit additional salt. Limiting salt is always a good thing. 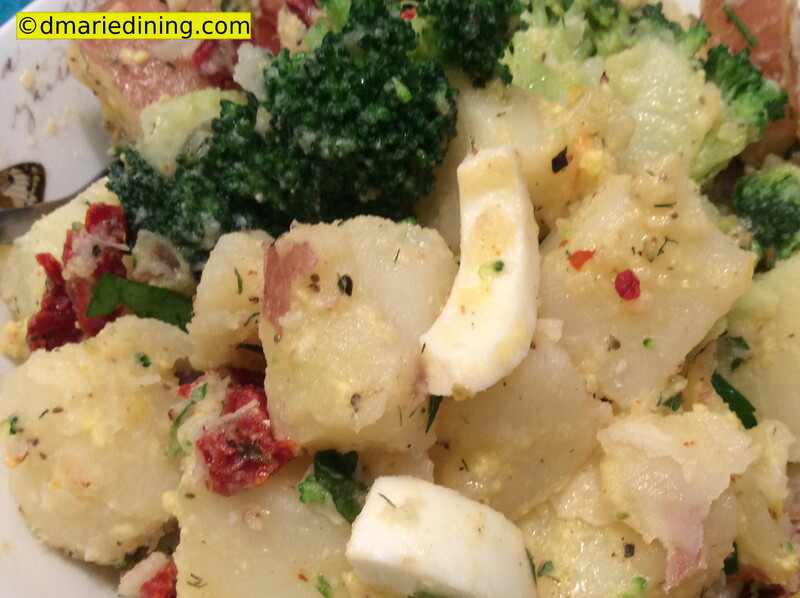 If you are a potato lover like me but want to find a healthier way to eat them, try my New Kind of Potato Salad. I think you will pleasantly surprised. Add eggs and a pinch of salt to a pot of water. Bring to a boil and cook for 5 minutes. Remove from stove and run cold water over eggs. Let cool for 5 minutes then chop and set aside. Bring 4 quarts of water to a boil with a pinch of salt. 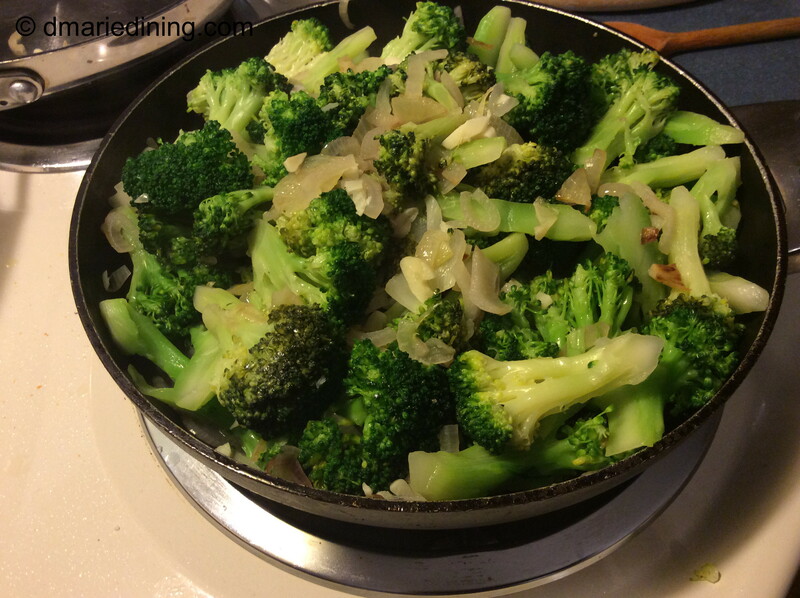 Add Broccoli and cook for 3 minutes. 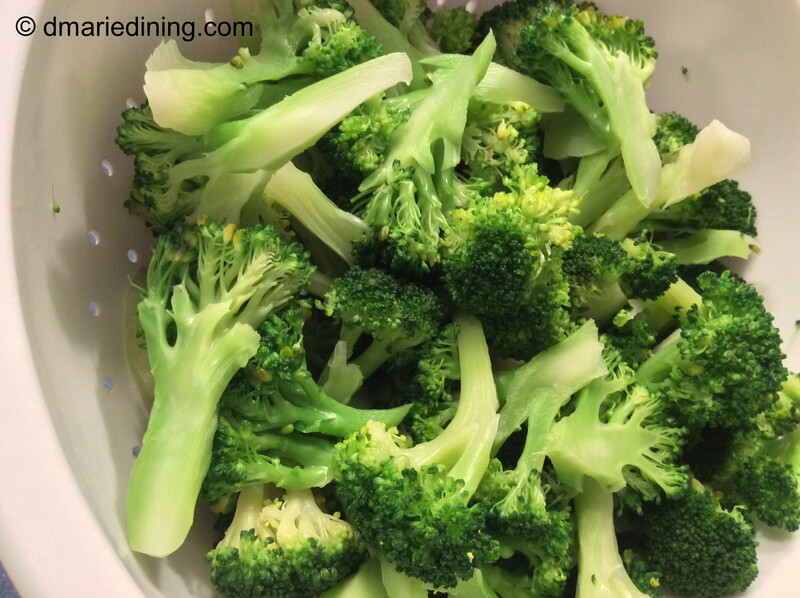 Remove broccoli and place in an ice bath to stop the cooking process. 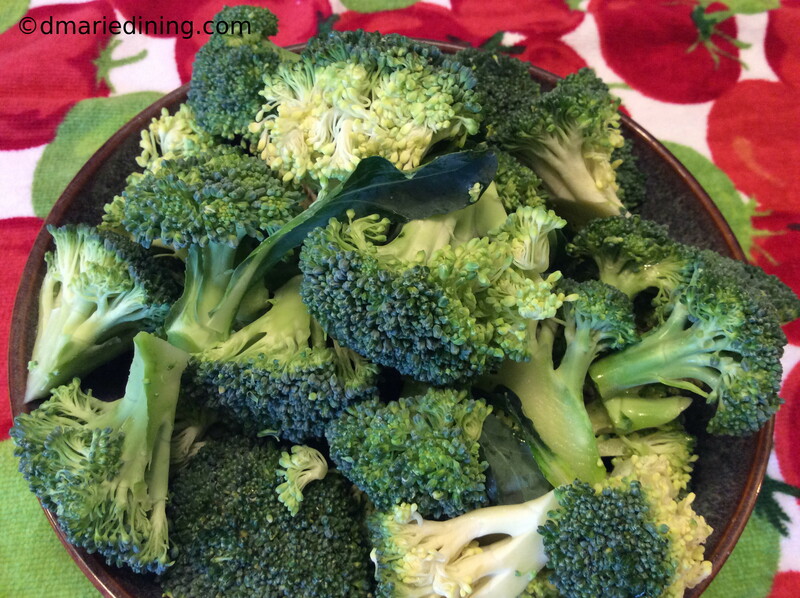 Drain broccoli from ice bath and set aside. 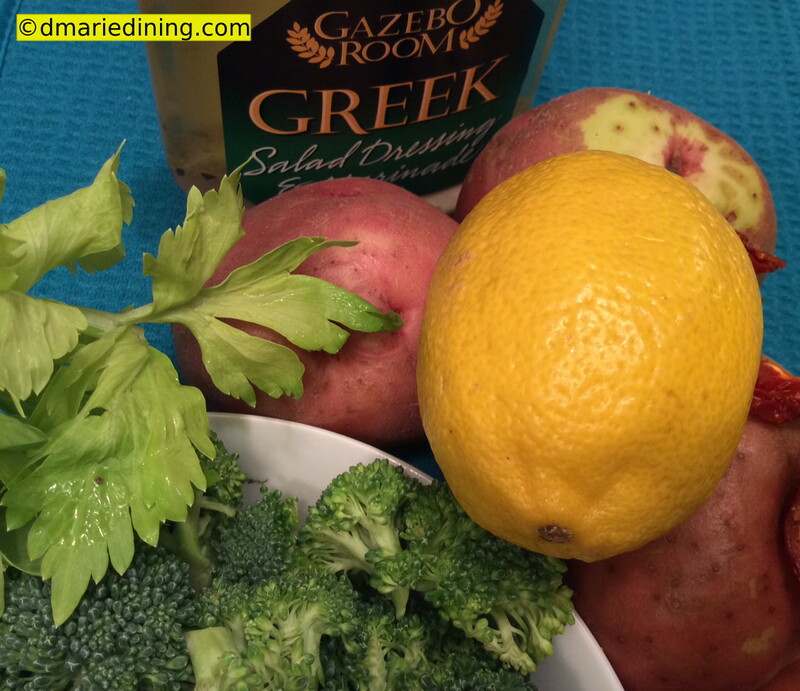 Bring broccoli water to a boil again and add potatoes. Cook until fork tender. Be sure not to over cook the potatoes or they will get mushy when you mix the ingredients. 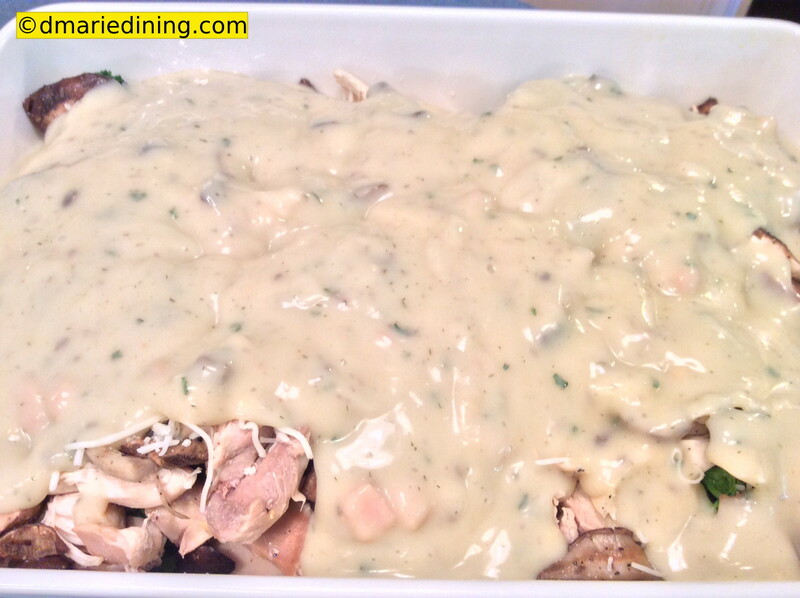 Drain potatoes and place in a large bowl. Whisk together the brown mustard and salad dressing then pour the mixture over the potatoes while they are hot so that the potatoes will absorb some of the dressing. Let the potatoes rest for 5 minutes. Add remaining ingredients and stir gently. Serve warm or slightly chilled. 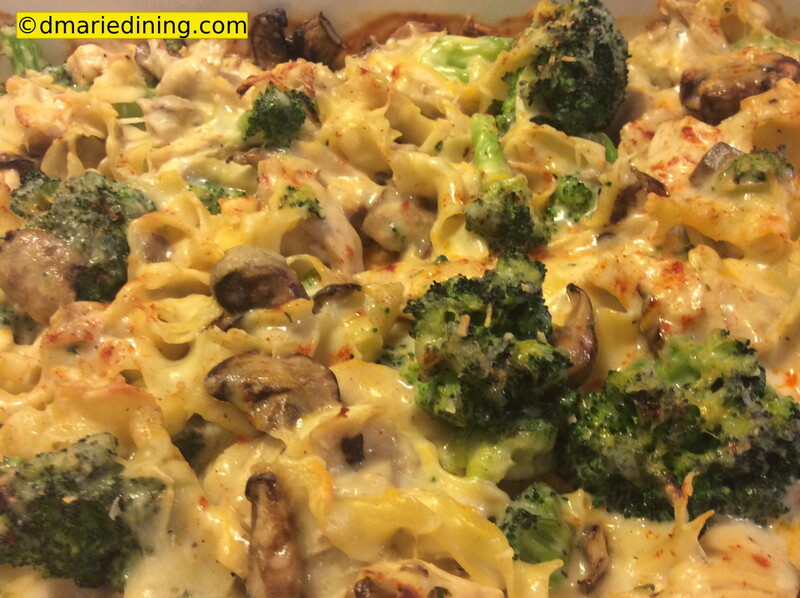 Sprinkle additional cheese on top if you really like cheese.